Suggested Use: 1 to 5 capsules to maintain or re-establish proper intestinal flora. Lactobacillus — it proves that ‘germs’ are sometimes good for you. Lactobacillus acidophilus is one of several types of ‘probiotic’ bacteria that live in the human intestines and assist in the digestion of proteins. Lactobacillus species are used in the production of sourdough bread, yogurt, cheese, sauerkraut, pickles, beer, wine, cider, kimchi, chocolate, and other fermented foods. overgrowth of Candida — a very unpleasant condition. When consumed as supplements, probiotic bacteria tend to optimize their populations in the intestines, enabling them to displace disease-causing bacteria and yeast that might otherwise gain a foothold. It may reduce blood cholesterol levels. It can increase the absorption of nutrients. It improves the digestion of lactose in milk. Using this lactobacillus supplement is like being able to eat a whole package of fresh yogurt simply by taking one little capsule. 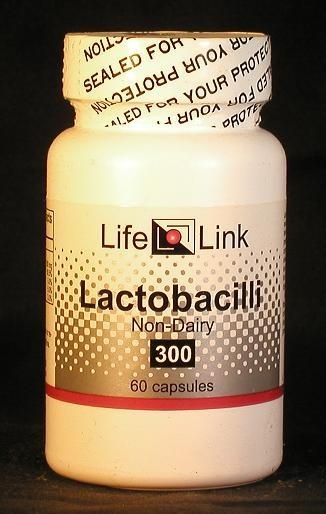 Lactobacillus acidophilus is one of several intestinal ‘probiotic’ bacteria that assist in the digestion of proteins and inhibit pathogenic organisms. Lactobacillus has antifungal properties, may reduce blood cholesterol levels, increases the absorption of nutrients, and improves the digestion of lactose in milk. Consuming probiotic bacteria as supplements or in cultured yogurt tends to optimize their populations in the intestines, enabling them to displace disease-causing bacteria and yeast that might otherwise gain a foothold. Less-than-optimal Lactobacillus concentrations can result in gas, bloating, constipation or diarrhea, poor absorption of nutrients, and overgrowth of Candida.